Our services for your party! Balloon twisting is one of our specialties. Our priority is to make sure that every child gets a balloon, so the complexity of the balloon twisting is based on how many kids you have at your party. If you are having a large amount of kids at your party but would like the more complex balloons, you can always hire us for more time or eliminate other activities. Invite our professional face painters to your next special event. 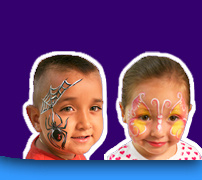 Our face painters use high quality, water-based face paint, specially formulated for face painting. It is safe for children and easy to wash off. For more information about the face paint we use, go to www.wolfefx.com. Our face painters can do cheek art or full-face painting as time allows. It is the face painter's priority is to make sure that every child has the opportunity to get their face painted, so the complexity of the face painting is based on how many kids you have at your party. If you are having a large amount of kids at your party but would like more complex or full-face painting, you can always hire the face painter for more time to insure that the face painter has the opportunity to face paint all who would like to get face painted. Our games are fun, exciting, and energetic. We bring out a colorful parachute and play a variety of games. The number of games we can play depends on the number of kids and their willingness to participate. Kids love our magic shows. Our magic tricks are geared toward children ages 4 and up, although the adults can’t help but be entertained as well! If the birthday child is old enough and would like to participate, he or she will be the special assistant and star of the show. We also offer magic shows performed by a magician. These shows run from 35 to 45 minutes and incorporate more elaborate tricks than the typical clown/character performance. For the remainder of the hour the magician will do balloon twisting or another activity of your choice, such as face painting or games.